It’s that time of the year when we start thinking of traditions for the holidays. Our family celebrates Christmas, and we do our best to minimize the “ME, ME, ME” aspect of Christmas that can be so prevalent with children. Here are a few ways we’ve tried to simplify Christmas, make December manageable, and create a special Christmas Legacy with our children during this time of the year. This post will contain Amazon affiliate links. This means if you purchase any of these recommendations f Amazon by linking through this blog post, I will receive a small commission. Thank you for your support! Jesse Tree. Several years ago a childhood friend sent me a box of Christmas tree ornaments and a book. She told me this was the Jesse Tree, a special celebration of Christmas her family enjoyed. In a nutshell, the Christian redemption story is told in 24 segments beginning December 1 with the Genesis story of creation, and ending with the birth of Jesus Christ. Each event is represented by an ornament and every day you read the corresponding text from the Bible and hang the ornament on the Jesse tree. It’s a really sweet tradition that puts the Christ in Christmas! Since that time we have changed a little bit about how we celebrate. We purchased a spiral candle that we light as we read each day of the story, and use the felt ornaments pictured to go along with Ann Voskamp’s Unwrapping the Greatest Gift, A Family Celebration of Christmas. 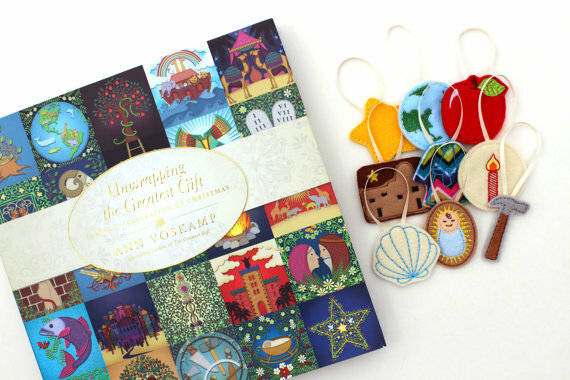 We just purchased this book, which includes ornaments and a 3D tree, to use this year – I’m really excited to use it! The Christmas Express. Some of my favorite holiday memories as a child included viewing Christmas lights! Twinkle lights make everything seem so magical! A few years ago I ran across the idea of a Minivan Express on the blog Confessions of a Homeschooler. We edited the idea a little (we don’t drive a minivan!) and have thoroughly enjoyed this tradition! One evening in December, without any warning at at, we send our kids to get ready for bed. 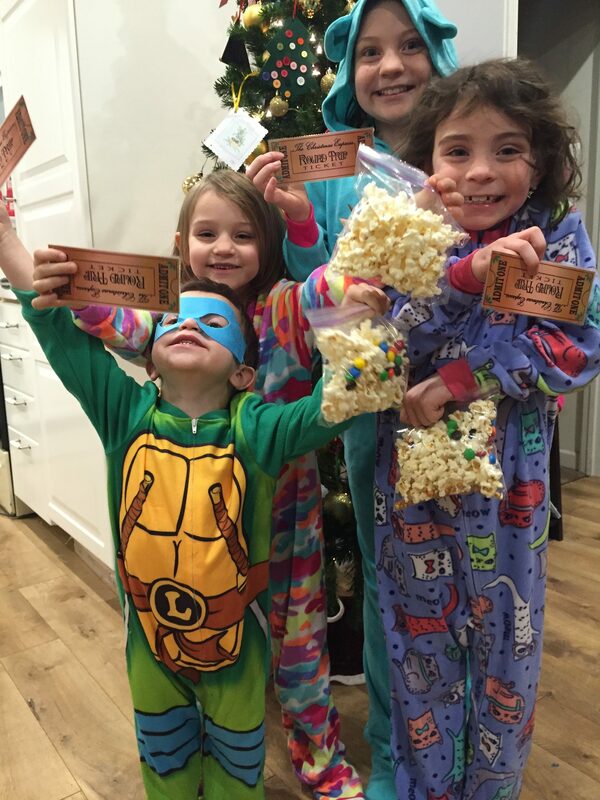 When they arrive there they find a new pair of pajamas and a golden ticket for the Christmas Express. We gather in the kitchen, take a photo with our tickets for posterity, hand out a travel mug of hot chocolate and popcorn with M&M’s, and tour the town looking at Christmas Light displays while listening to Pentatonix or Straight No Chaser holiday albums. It’s amazing. They love the surprise of it all, and we love the opportunity to do something that’s practically free and fun for all involved. Kindness Elves. This will be a new tradition for our family this year. I’ve never really gotten on board with the Elf on the Shelf idea for a few reasons: I’m not that creative, I don’t see why I want an imaginary elf making mischief I don’t want my kids to emulate, and there are too many ideas on Pinterest which scares me a lot! Ha! However, this year I’ve stumbled across a wonderful idea from The Imagination Tree that sounds pretty phenomenal. It’s a Kindness Elf – where the elf still can be hidden but suggests practical ways to be kind to one another during this season that can often feel full of hectic selfishness. I love it! 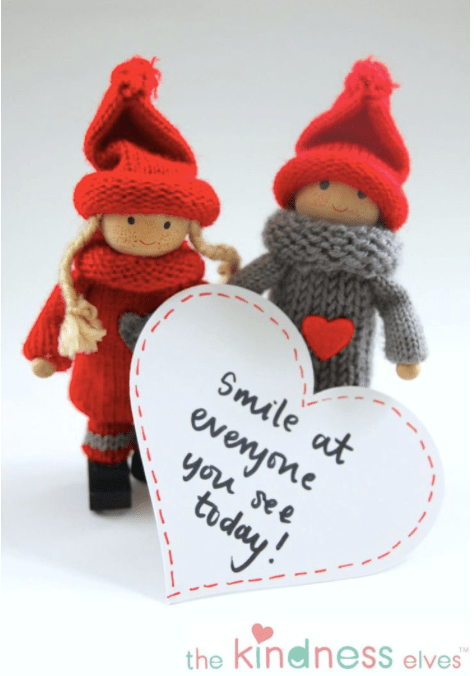 We purchased these Elf ornaments, inspired by traditional Swedish Tomte Santas, and I will be using these Kindness Elf Idea Cards to make our December more “others”-focussed. I can’t wait! These are a few of the things that we do in December to set it apart as special. We’d love to hear more about your traditions!